After having blogged last month that I do not use multimedia well I found that Scrap the Girls have asked us to use texture paste and paint! I must admit that I am not entirely happy with this page, especially the yellow, paint tinted mask but I am resolved to use it anyway. This is our only granddaughter, she is surrounded by four uncles and six male cousins; her Mum and Dad met on a road crew in the outback when working on a major road link between our remote state and the rest of Australia so it is of little surprise to see that they had found some hi viz work gear complete with her name embroidered, little work boots and work socks that repeat the pink and navy of the shirt. We had gone to help complete some paving and the little miss was determined to help shovel the sand and, with a tiny pair of work gloves, carry some bricks. I have completed a second page as I love the connection between our 'hi viz miss' and her Pop; we had stopped for a tea break and Pop had plonked himself down on a stack of bricks and crossed his legs whilst drinking his coffee, seconds later the little miss has stacked some bricks beside him, grabbed her drink and after checking Pops position, crossed her legs in the same way and taken a drink. 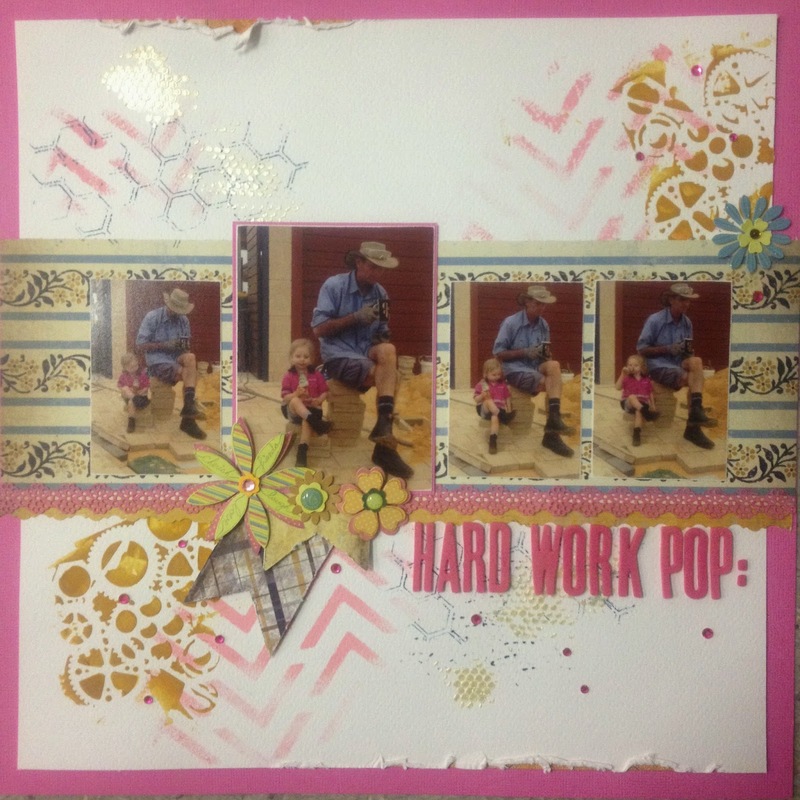 'Hard work Pop, hard work!' said the little miss. 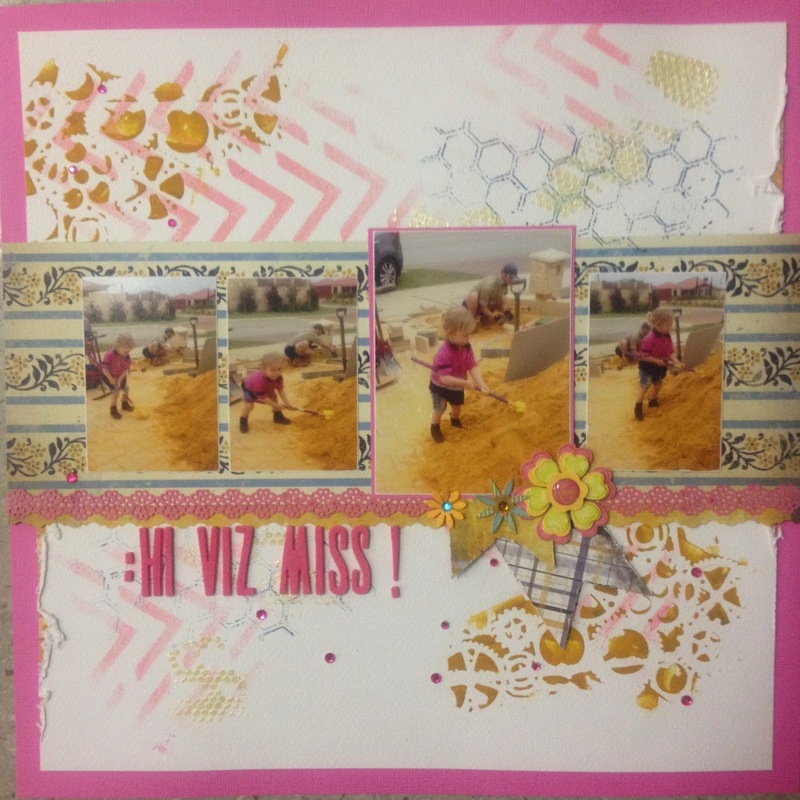 Oh great photos and love your back ground MM.. thanks so much for joining in at Scrap the Girls this month too Susan! These are beautiful Susan …. I love the story behind the photo's too.